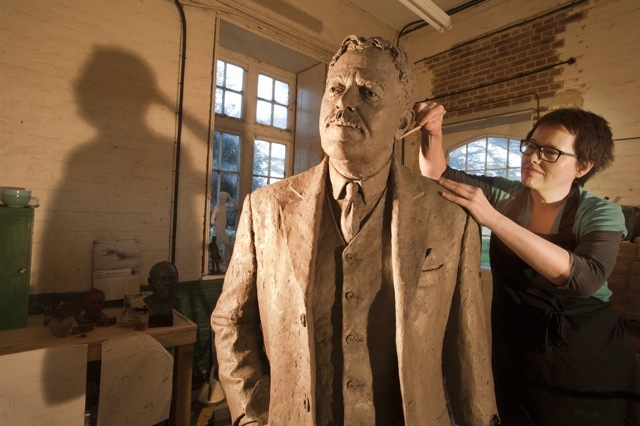 Hazel Reeves SWA FRSA is putting the finishing touches to her sculpture of Sir Nigel Gresley. After almost a year’s work to complete her 7ft 4in statue of the eminent steam locomotive engineer, Ms Reeves is weeks away from the planned unveiling at King’s Cross station. All that remains is for final adjustments to be made to the metalwork and for the bronze to be coloured by Ms Reeves, who is an award-winning figurative sculptor from Brighton. The statue of Sir Nigel Gresley will be unveiled on the 75th anniversary of his death on Tuesday April 5 at 11am on the Western Concourse at King’s Cross station. Hazel Reeves SWA FRSA is an award-winning figurative sculptor, passionate about people and their stories, with figure and portrait commissions in bronze a speciality, such as this monumental Sir Nigel Gresley statue for King’s Cross station. In 2014 the Gresley Society Trust commissioned Hazel to sculpt a maquette (or scale model) of Sir Nigel Gresley, with a mallard duck at his side. 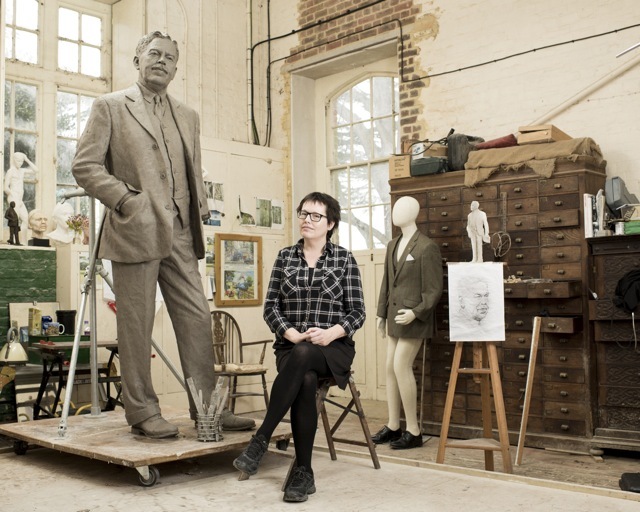 In March 2015, she was commissioned to sculpt the final 7ft 4in statue of Sir Nigel Gresley, without the mallard. The clay of the statue has been completed, the mould made and the statue cast in bronze at Bronze Age Sculpture Casting Foundry in the Docklands, London. ‘[Sir Nigel] was one of the leading British locomotive designers of the age of steam. A mechanical engineer of great skill, he also had the imagination and boldness to innovate, a flair to organise and to lead, an artist’s eye for line and proportion, and a touch of showmanship’, Gresley Society Trust website. The Flying Scotsman has been in the news in the past weeks as it is back ‘in steam’ and ran the East Coast mainline, from King’s Cross to York, after ten years of restoration costing over £4 million.